If you own or manage a commercial printing or quick copy business, or are a graphic designer, and you’d like to increase your sales and profit margin, then you’ll really be interested in this new project. I’m Andre Palko, and I spent nearly 25 years working IN printing companies, and then another 15+ years as a vendor TO the industry as President of Technifold USA Inc. I only bring that up because it’s my time and experience in printing (on the firing line in sales and behind the scenes in production) combined with lots of video creation experience, that sparked one of those exciting eureka moments. I was an early adopter of video work in B2B marketing in the printing industry, creating lots of useful video content to help customers understand products and print finishing concepts. Video was, and continues to be, extremely valuable in lead generation and customer support roles. Through the years I collected a lot of tools and apps to help with that sort of video creation. Recently I was using a relatively new video app for a client’s marketing project when an unusual idea hit me. Short, simple videos could easily be used to leverage sales growth in printing businesses and in graphic design companies. Right off the top of my head I saw four ways to do this. And it’s as easy as posting to social media. To my knowledge, nobody in printing is using video this way because up until now, it would have been too hard to implement. But I suspect that many small commercial printers and graphic designers will soon be adopting this technique. The feeling is very similar to what I had when I started representing Technifold products about 17 years ago. It was a game-changing moment and I believe this type of video marketing can be, too. I felt strongly that printers could benefit, so I secured commercial licensing rights to offer this new video app to other small businesses. Because the idea revolves around video, the best way to demonstrate is to show you via video. 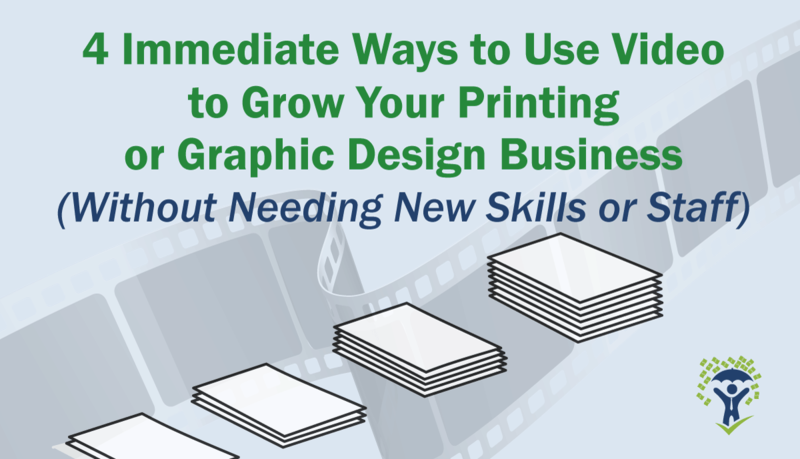 In it I give you four ways to use video to get richer margins than you typically get putting ink or toner on paper. And I know from my own past experience as a print shop manager how incredibly hard it is to maintain margins in printing. There is always fierce competition and shifting technology. The best part is that you can do any of these, or all four of these, without needing any special video skills. It requires no new software, no special training, and no new personnel. In fact, you can probably start with apps you already have on your computers. Even better, you already have the customer graphics you need to put this into action. Yet even if you have zero interest in using video, (and I believe that’s a mistake) you can still benefit from watching the webinar. The four techniques I talk about here can instantly be applied to products and services you already offer. However, I urge you to be open-minded about the topic of video in your printing or graphic design business. I’m really excited about what I’m going to show you…I think it can be a game-changer for a lot of small companies just like yours. Based on the few hundred printer’s websites I looked at, I’ll wager that you have NOT thought about using video like this. When you join me on the webinar, you can also get two free marketing bonuses. No purchase is required, it’s just my “thank you for watching” gift. 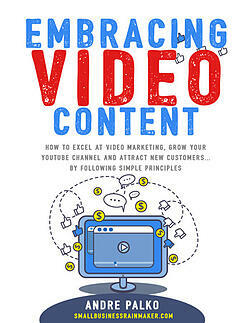 1) Get a Free copy of Embracing Video Content in Your Small Business. It’s a simple how-to primer that will turn you into a video marketing pro in 30 days or less. Video marketing isn’t hard, but it IS important to follow certain steps in the right order. 2) Get a formatted transcript of this webinar. Use it as reference to apply the marketing techniques we cover to other aspects of your business—even if you never plan to use video. I promise you’ll find value far in excess of the time spent on the webinar (less than an hour). So, get the scoop on your competition with these techniques and join me in this webinar today.